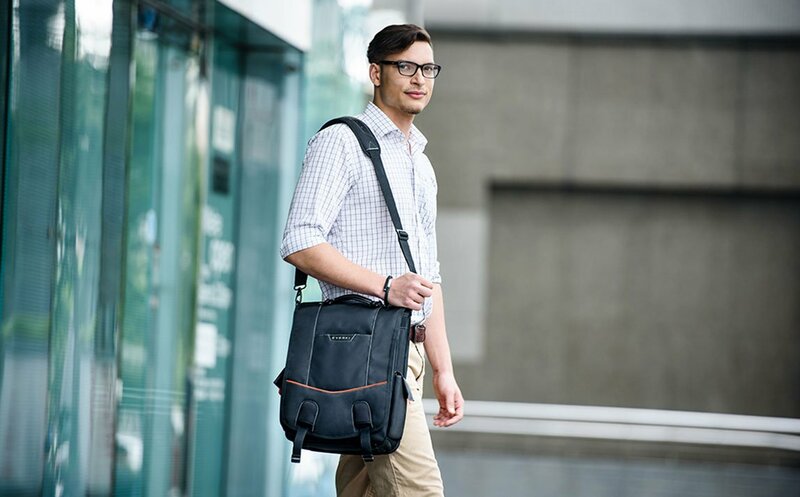 If you’re looking for a bag that’s perfect for business transactions and flight connections, you’ll love the fresh style and hands-free function of the Urbanite Vertical Messenger. The profile is slim, but it’s still capable of handling a laptop, tablet and all your business essentials. The Urbanite works as well traversing the country as it does navigating the city streets. For your daily commute or business travel, choose the metropolitan look and versatile function of the Urbanite Vertical Messenger. 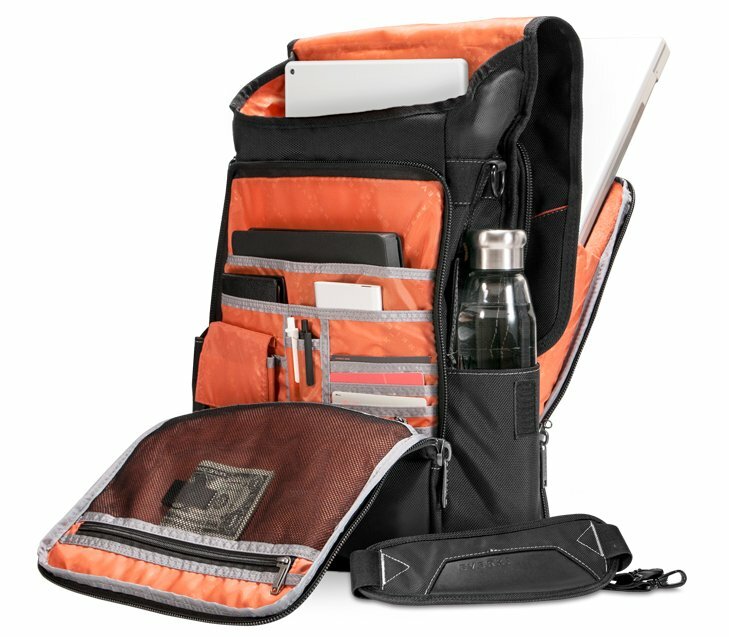 This fashionable vertical messenger works great as a laptop sling or as your favorite everyday bag, and the slim and sleek profile carries a surprising amount of gear without becoming too bulky. 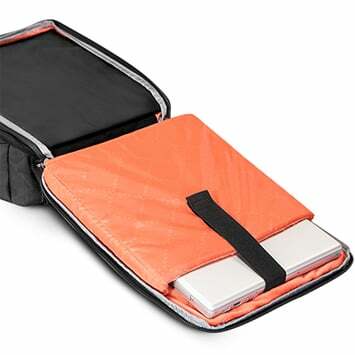 With felt-lined spaces to hold both a tablet and a laptop, it can manage all your technology, plus organize your folders and reports, traveling essentials and even additional peripherals. It’s constructed with high quality body fabric, stylish leather and metal accents, and tons of useful compartments – the Urbanite helps you conquer the urban jungle. The dedicated laptop compartment of the Urbanite can easily handle a 14.1-inch laptop or a 15-inch MacBook Pro; and its travel friendly design helps you breeze through security checkpoints. Access the front compartment with the speed release buckles and you’ll find a multiplicity of pockets, slots and pouches to keep everything you need right at your fingertips. Inside the main compartment, a felt-lined pocket will keep your iPad or Kindle safe; and there’s even more space for books, folders or reading material – and room enough for a sweater or light jacket. 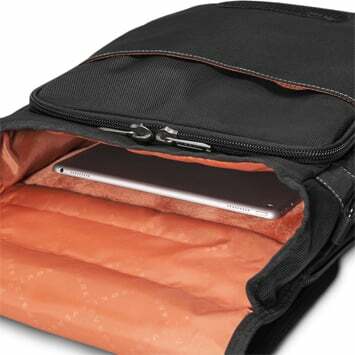 And on the sides – you’ll appreciate the multi-functioning pockets for water or smaller technology. The Urbanite comes equipped with a dedicated laptop compartment that’s Checkpoint Friendly. Simply open the Urbanite up 180 degrees, lay it flat, and quickly pass through the scanner. Should you need to remove your laptop, you can access it easily without removing other contents. The Urbanite has a separate, fully lined tablet pocket to safely stow your iPad or Kindle. Super-soft felt will keep your tablet safe and secure, and your device won’t rub against anything else you have in your bag. When traveling with many bags, the trolley handle pass-through on the back of the Urbanite allows you to double your efforts. 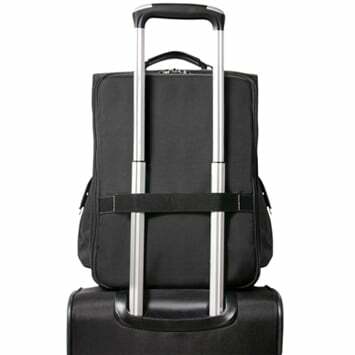 Simply slip the Urbanite onto the handle of your luggage and you’re ready to wheel through the airport. The Urbanite incorporates a contoured and removable shoulder strap system to ergonomically balance the load and reduce muscle strain. Dual quick-adjust buckles let you adjust the strap to your desired length, and a large, non-slip shoulder pad conforms to your shoulder. That’s smart design. I just purchased my Urbanite a few days ago and I already love it. I've had a Timbuktu bag for years, but it didn't have enough organizational ability. I'm a theatrical production manager and I practically live out of my bag and need to keep a lot of weird stuff handy and organized. This bag does all of that, multiplied by 100, plus it looks great. I've already gotten two comments on the look of it. When I open it up and show off the pouches and orange interior (easy to see things in a dark theatre), I get a lot of questions for where to get one! Had the Urbanite for a couple of weeks now. So far so good. I like the looks and organization of the bag and it seems to be built well but time will tell. So far the only downside is that the water bottle pockets on the side are too small to be useful. I haven't found a bottle yet that fits. I bought an Urbanite 2+ years ago. The quality of the bag is excellent. It is the best quality bag I've owned. After two or so years the shoulder strap was breaking down so I submitted a support request. The version of Urbanite I had was designed with a strap that could not be removed (the new version has been redesigned so the strap can be removed/replaced). I sent in some requested pictures and working with Daniel O. at Everki. Daniel determined the bag needed to be replaced with the new strap design. 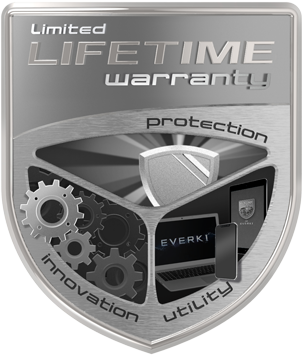 I was pleasantly surprised how Everki supported me and backed their product. I had a new Urbanite, at no cost, in just a few days. I will say this based on my experience. Everki loves and back their products. The products are of high quality (I travel over 150K miles/year). The Urbanite is a tough bag made to take a lot of travel wear and tear. Well done, Everki. You've made a customer for life. Excellent vertical messenger bag; great value. Excellent vertical messenger bag. Great value for the price. I have had this bag for a little over two years and it shows almost no signs of wear. I use it daily and on all business and personal trips (air and road). Here are a few random thoughts I have which may be helpful, none are critical as I am very satisfied. In my job I work in files that are 14 inches tall and can get very thick with paper. 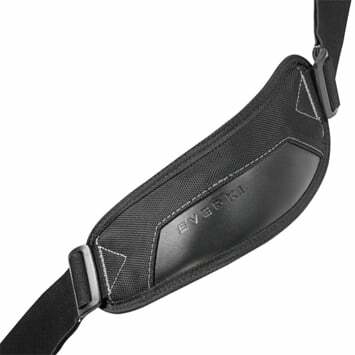 I looked for a vertical messenger bag that could accommodate, which was critical for me. They fit easily in this bag, however, they sometimes snag on the internal divider (always when I am in a hurry). I read someone say they pinned or clipped it (not cut) with success. The clips on the main flap can get tiresome, again when I am in a hurry. I do clip them because my files can get heavy and I do not want to stress or tear the bag. Some airports will still require my laptop to be fully removed from the bag. I think they are wrong but I comply to avoid a cavity search. With the many useful pockets and compartments, if I am lazy I tend to leave in too many items after trips making the bag heavier than it needs to be. Just received this messenger bag and all I can say is WOW! You created the bag I've been dreaming about. This is perfect for my 13" MacBook Pro as well as the other accessories and my iPad Mini. The quality of construction is quite impressive as well. This bag feels substantial but not heavy like my Victronix backpack which is rather heavy even when empty. I have spent most of my professional career traveling, both domestic and international. Throughout my career I've only had a couple of bags I REALLY liked. This bag blows them away. I am also quite impressed with the overall look. The only reason I giving it 4 stars is because I don't know how well it will hold up over time. Otherwise, kudos to you and your design staff for a truly wonderful, well thought out bag. I have put all of my travel electronics as well as my DSLR in this bag and I still have room for additional items and the bag is still sleek! The arrangement of the various pockets and compartments are ideal for all the accessories with easy access. While I thought, at first, this bag was a little expensive, it is clear that it is well worth the asking price. Well done Everki!